If you’re a Colorado big-game hunter, now’s the time to prepare for the 2018 hunting seasons. 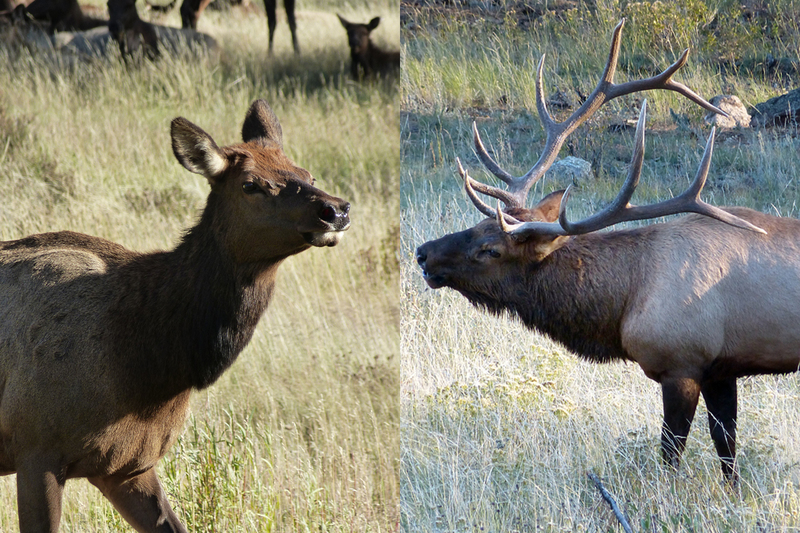 A primary tool used in the management of Colorado’s big-game animals is a limit, or quota, on the number of licenses issued in most game management units (GMUs). When applying for a limited license, a preference point is awarded when an individual is unsuccessful in drawing their first-choice hunt code. Preference points provide a mathematical advantage when applied to future drawings. Download the 2017 Colorado Outdoors Preference Point Issue (Online Edition). If you’re a Colorado big-game hunter, now’s the time to prepare for the 2016 fall hunting seasons. Many of Colorado’s big-game licenses are allocated through a limited drawing based on a preference-point system. Colorado Outdoors magazine is a must-have resource if you’re planning on participating in this year’s drawing. The Jan/Feb issue features preference-point data and statewide big-game population estimates to help guide you in applying for a limited big-game license. Don’t miss out on your opportunity to experience the thrill and adventure of a Colorado big-game hunt this season. The application deadline for the 2016 limited-license drawing is April 5. To order the 2016 “Preference Point” issue or to purchase an annual subscription to Colorado Outdoors, please click HERE. For more than 75 years, Colorado Outdoors has been the official publication of Colorado Parks and Wildlife (CPW) and the only magazine dedicated to Colorado’s wildlife. Colorado Outdoors offers valuable insight from CPW experts regarding hunting and fishing, endangered species recovery efforts and wildlife management. 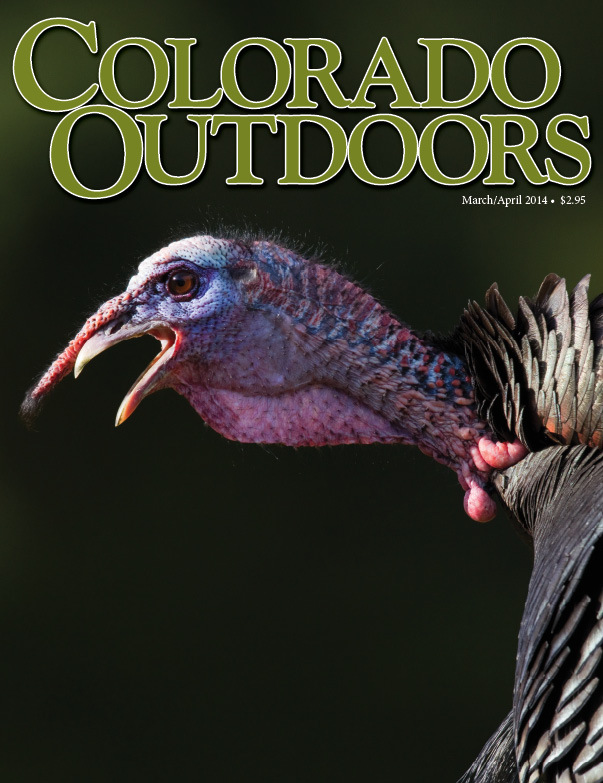 The September/October issue of Colorado Outdoors is now available and features a wealth of information for hunters, anglers and wildlife enthusiasts. To view the entire contents page for this issue, click here. To order the September/October issue, back issues or to purchase an annual subscription to Colorado Outdoors magazine, click HERE. The July/August issue of Colorado Outdoors is hot of the press and is packed full of articles for the outdoor enthusiast! Hunters and anglers will learn how to lighten the load when selecting backpacking and camping gear in “To Go Light or Ultralight, That Is The Question.” And big-game hunters can discover the logistical advantages of setting up a separate camp for elk hunts in “Spike Camp.” In addition, “Different Deer” presents the similarities and differences between mule and white-tailed deer — just in time for the fall hunting seasons. Colorado anglers will learn tactics for fly fishing the Rio Grande in “South Fork Rio Grande,” and how birds may be the best fishers of all in “Avian Anglers.” Also featured is “Living With Bears,” a photo essay with tips on safely hiking and camping in bear country. To view the entire contents page and all of the articles included in this issue, click HERE. To order the July/August issue or to purchase an annual subscription to Colorado Outdoors magazine, click HERE. It’s March madness, Colorado style. For hunters and anglers, March is the perfect month to shake off the delirium of cabin fever by preparing for the upcoming spring/summer hunting and fishing seasons. It’s also an excellent time to look back and reflect upon last fall’s big-game hunts. The March/April issue of Colorado Outdoors features the “2013 Big-Game Wrap-Up,” which includes a statewide recap of last year’s deer and elk seasons. In addition, hunters will learn how to select camo for the upcoming spring turkey season in “Crazy About Camo.” Anglers will learn tactics for fishing the Gold Metal waters of Gore Creek in “Dredging Gore Creek Gold,” and how fly fishing with streamer flies can produce large, trophy-sized fish in “Streamer Trout.” To view the entire contents page for this issue, click here. To order the March/April issue or to purchase an annual subscription to Colorado Outdoors magazine, click HERE. 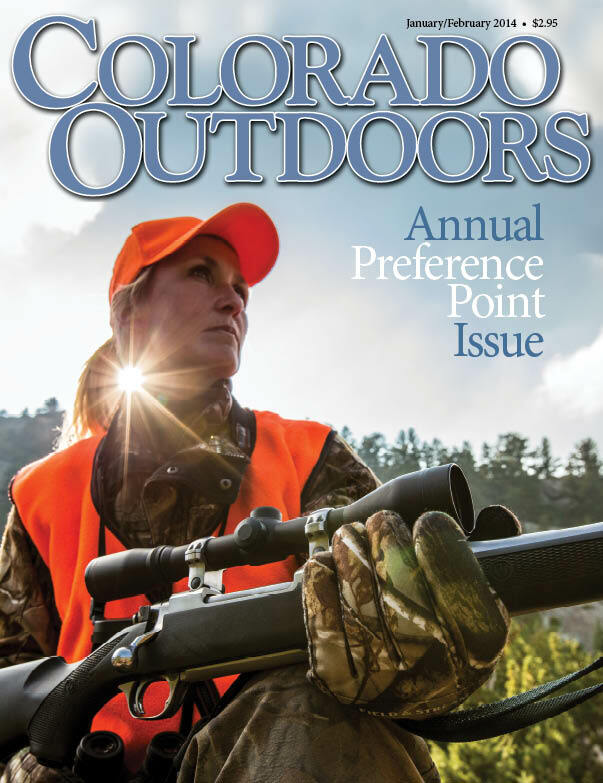 Colorado Outdoors magazine ‘Preference Point’ issue. Spring is right around the corner — time to hang up your camo clothing and forget about hunting until next fall, right? Wrong. For Colorado big-game hunters, there is no better time than right now to prepare for the fall hunting seasons. Colorado Outdoors, Colorado Parks and Wildlife’s in-house conservation magazine, is a valuable planning resource for hunters. The Jan/Feb issue features preference-point data and statewide herd-population estimates to guide big-game hunters in selecting Game Management Units (GMUs) and applying for limited licenses. The application deadline for the 2014 limited-license drawing is midnight, April 1. To order the 2014 “Preference Point” issue or to purchase an annual subscription to Colorado Outdoors magazine, please call: 1-800-417-8986.